The Korus house was a superb place to stay. Nadia contacted me a few days before my scheduled stay inquiring if I had any questions. She sent me detailed directions which included pictures which were very helpful and reassuring. Ryan met me at the secure, clean, and fully furnished facility. He was informative, patient, and friendly, extending a warm welcome to me upon my arrival. The room was pristine with amenities. I felt very safe with the building, apartment, and room, security measures. Great location for airport access and late night/early morning flights. Owners are super involved and helpful. Enjoyed my stay. I stayed at this hostel for one night in early August, having arrived to Gimpo Airport that evening and scheduled to depart the following morning from Incheon. The hostel interior was very clean and well maintained, the staff courteous and hospitable. I rested well that night and would stay again. Absolutely wonderful hostel. I have stayed here once before. 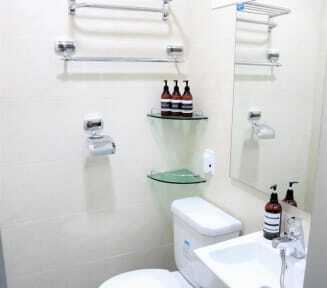 It is a little small, only two rooms, but the rooms and bathrooms are very clean. The bedrooms are well kept and the beds are very soft. The food offered for breakfast is simple, but amazing: coffee, tea, bread, peanut butter, jam, cereal, etc. The staff was wonderful. The staff met me at the door and went over everything with me about the hostel. I plan to book this hostel every time as they are close to Incheon Airport. Excellent staff, great room set up and very close to the airport. Highly recommend. would go back. 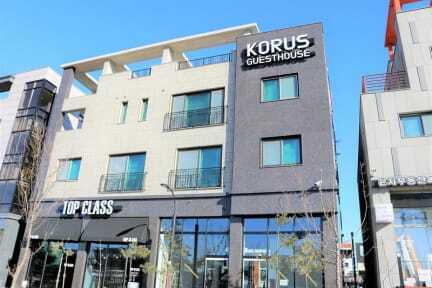 Korus Guesthouse is the perfect place to stay before an early flight as it’s incredibly close to Incheon airport. The place itself is immaculately clean and I was even provided with toothpaste and a toothbrush! Would definitely stay here again. The owners were the kindest, the room was extremely clean, and it was a great stay! I wish I could have stayed longer at this hostel compared to the hostel I had stayed before.